That’s bird-Friday of course. And bird-Friday got off to a pretty chilly start. It was 26 degrees Fahrenheit when I got to Lake Junaluska at around 8:45 a.m. Not much has changed species-wise at the lake for the past couple of weeks or so except the red-heads were gone. At least I didn’t see any Friday. There still were plenty of ring-necked ducks, ruddy ducks, pied-billed grebes and coots. There were a couple of lesser scaup and I also saw one bufflehead, four hooded mergansers, one great blue heron, three horned grebes and one double-crested cormorant. I also found a Cooper’s hawk keeping a close watch on the coots in the little channel between the wetlands and the narrow island. Counting a few passerines, I wound up with 27 species for the hour I spent around Lake J. Next I headed for Kituwah to get my sparrow fix and see what else I might find. I got to Kituwah around 11 a.m. and it was still cool, mid-30s, but warming nicely. I was greeted at the entrance to Kituwah by an immature red-tailed hawk perched in a small tree. I recorded three red-tails for the morning but suspect there were five. It’s hard to tell after an hour or so if you’re seeing a different hawk or the same one. But I know I saw two adults and at least one immature. I also had one immature red-shouldered hawk near the wetlands. The railroad track at the entrance also provided one of my target sparrow species as I found three adult white-crowned sparrows. Next, I was treated to a splash of late autumn color when I found four brightly plumaged eastern meadowlarks – their lemon-yellow breasts shining in the morning sun against the short green grass they were foraging in. Song sparrows were everywhere and field sparrows were fairly common but after nearly an hour I still hadn’t found any white-throated sparrows. When I finally found some white-throateds, I found two groups in proximity that probably had at least 50 birds between them. I didn’t investigate too long because a flash of rufous leaving the cornfields for a nearby woody tangle alerted me to the possibility of another target sparrow. Sure enough, I approached the tangle and pished and up popped three dapper fox sparrows. 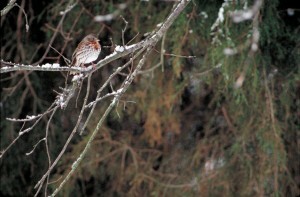 These large handsome sparrows are one of by favorite winter birds and Kituwah almost always provides a few. There was one other sparrow that I expected to find at Kituwah so I headed to the wetlands and slogged around, much to the chagrin of a great blue heron looking for a meal, in search of swamp sparrows. It was there I stumbled upon the rarest bird of the day. I saw a lot of sparrow activity in a brushy clump at the edge of the soggy area. As I approached to investigate I heard the distinctive, dry double chit or chat call of a sedge wren. I circled the clump about three times from as close as 10 feet, flushing at least a half-dozen song sparrows but never getting a look at the chatterer. I left it chattering and slogged on around the wetlands finally flushing three swamp sparrows. 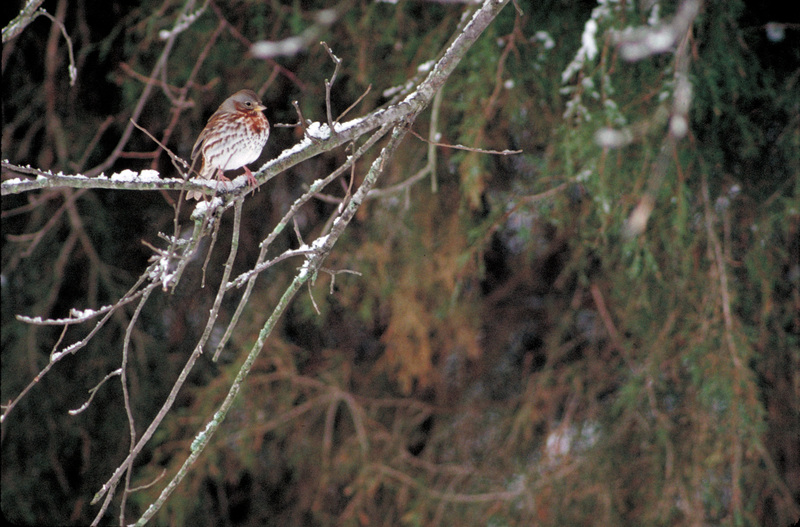 I wound up with six species of sparrows – song, field, white-throated, white-crowned, fox and swamp and good looks at another one of my favorite winter birds the hermit thrush. The total count for a couple of hours at Kituwah was 36 species. Not a bad B-Friday and I didn’t have to stand in a single line.